Stéphane, Marc. 1959. 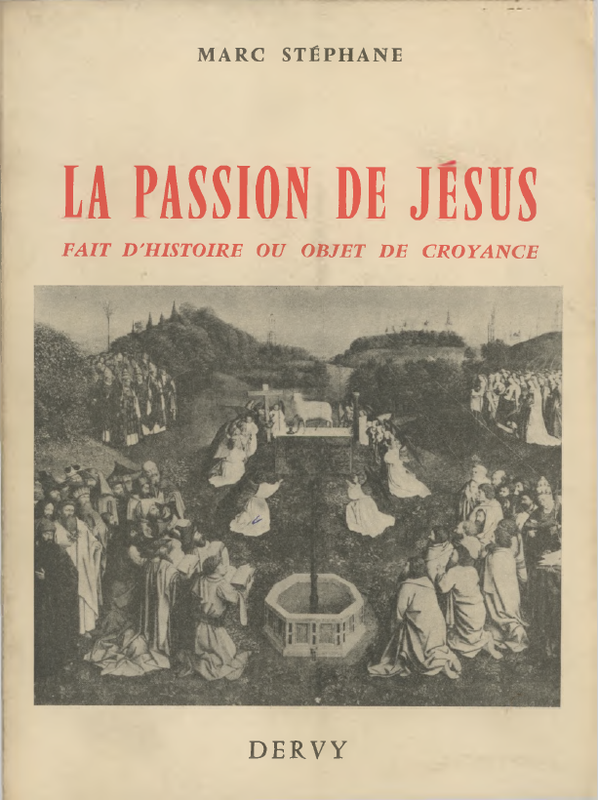 La Passion de Jésus : Fait d’histoire Ou Objet de Croyance. Dervy-livres Besançon, impr. Jacques et Demontrond. The French historian Marc Stéphane took up the question of the existence of Jesus and after engaging with the critical scholarship of his day, in particular that of “anti-mythicists” Alfred Loisy and Charles Guignebert, as well as mythicist Prosper Alfaric, and after delicately warning devout believers that he was not seeking to undermine their faith but was endeavouring to write an argument from a point of view that believers were free to ignore, wrote his own perspective on the question. Seven points. I’ll stop there. Why spoil God’s design! Posted on 2018-10-13 06:09:59 GMT+0000 by Neil Godfrey. This entry was posted in Biblical Studies and tagged Ascension of Isaiah, Gospel of Mark. Bookmark the permalink. Excellent, Neil. I have to smile when I read a post like this, as it brings to light yet another writer from way back when ( long before the plethora of ”modern” half-baked apologists arrived on the scene) who sought to show just how the Jesus tale is so much nonsense. Does Sthéphane say where, according to the early Christians, Jesus was hung on a tree, if in the lower heavens or on the earth? That would be Galatians 3:13 where Paul quotes Deuteronomy 21:23 from the Septuagint, which uses a Greek word that can mean “tree”, “wood”, or “cross” but the Hebrew version uses the word for “tree”. I’m not understanding here. Did Mark have or not have “the Jewish scriptures and Paul’s letters?” This seems to be saying, to me, that he didn’t have them as reference. He had no historical material, no orally transmitted memories. He only had Jewish scriptures and Paul’s letters. There is a French review by one Hadot to the same book, available online at http://www.persee.fr/doc/rhr_0035-1423_1962_num_161_2_7772 . Bam! This guy agrees with me. I think the author of Mark used Jewish Wars and got the name “Pilate” from that, which doesn’t have “Pontius”. Luke 3:1 used “Pontius Pilate” where the author was using Jewish Antiquities but used only “Pilate” when using gMark. No, he made no reference to any supposed Domitian persecution. He drew upon many factors to make an assessment of the date and came down, as a kind of compromise he felt the various details forced upon him, to around 90 ce. I have withdrawn my reference to Doherty in the post because I cannot find what I thought was his reference to the implied Jewish persecution of Christians around 90 ce (i.e. the curse on heretics; the birkat ha-minim) in connection with dating Mark in either of his books. Perhaps he made the connection in a forum post sometime, or perhaps I am misremembering. Does Stepháne have examples of Jews of Roman occupied Judea being permitted to expose the corpses of executed convicts to living trees? Did Herod the Great do this? for as he was feasting with his concubines, in the sight of all the city, he ordered about eight hundred of them to be crucified (ἀνασταυρῶσαι, ‘staked’); and while they were living, he ordered the throats of their children and wives to be cut before their eyes. I don’t think there were 800 trees growing on the grounds of the palace. As I recall his point, it is that “Mark” is historicizing the things believers knew from such writings as those of Paul. Paul said that Jesus became cursed for others by being hung on a tree. It is that passage in Galatians that “Mark” is historicizing. And that passage in Galatians is a reference to the shame of an executed criminal being hung up on a tree for public display. The corpse is strung up. “Mark” is historicizing theological claims found in Paul and probably similar writings or teachings. Marc Stéphane is well aware of Roman practice and the history of Alexander Jannaeus and this contrast leads him to draw a an explanation for the difference between the Roman practice and the Jewish claims in their writings — and why “Mark” changed the theological teaching to a manner of execution that cohered with what readers knew from experience.